Download application form for Women University Azad Jammu Kashmir WU AJK Bagh Jobs Via NTS from here. Last date to apply is Saturday, 20th April, 2019. Women University of Azad Jammu and Kashmir Bagh is a public university located in Bagh, Azad Jammu & Kashmir. AJ&K Bagh Women University has been established in 2014 by an Act (vii) of 2014 to provide the opportunities of qualitative higher education and to promote research activities in the region. Applications are invited from candidates to fulfill the posts in WU AJK Bagh on regular basis. All those candidates who have the require qualification and skills and are eligible for the Women University Azad Jammu Kashmir Jobs Via NTS must apply to grab this golden opportunity. 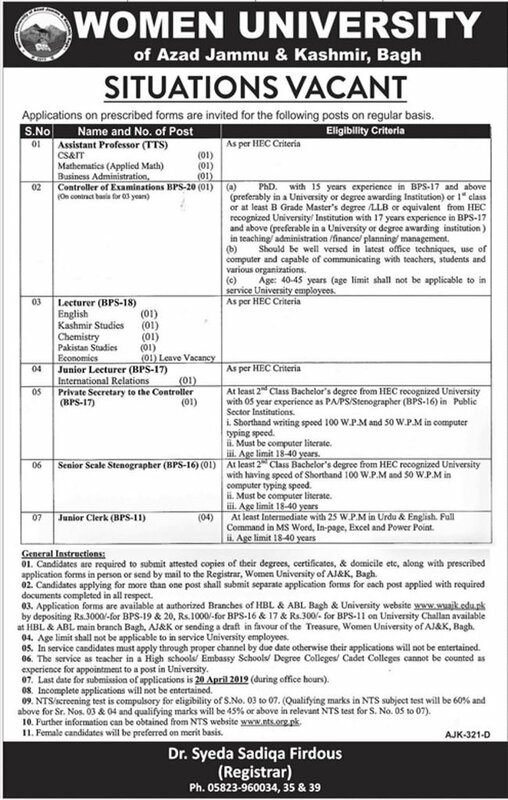 Applying procedure as well as other requirements for the jobs in Women University Azad Jammu & Kashmir are mention below. How to Apply For Women University Azad Jammu Kashmir WU AJK Bagh Jobs Via NTS ? Female candidates will be preferred on merit basis. Last date to apply is Friday, 12th April 2019.